It’s time to follow up with the infinity or loop scarf topic. 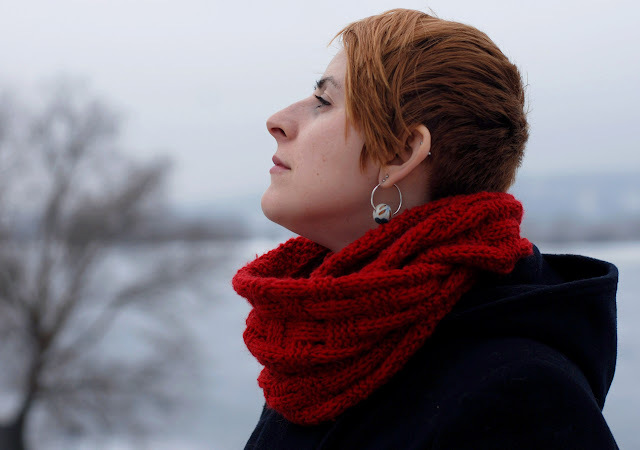 A wrapped around your neck knitted infinity scarf will keep you warm during cold winter times. 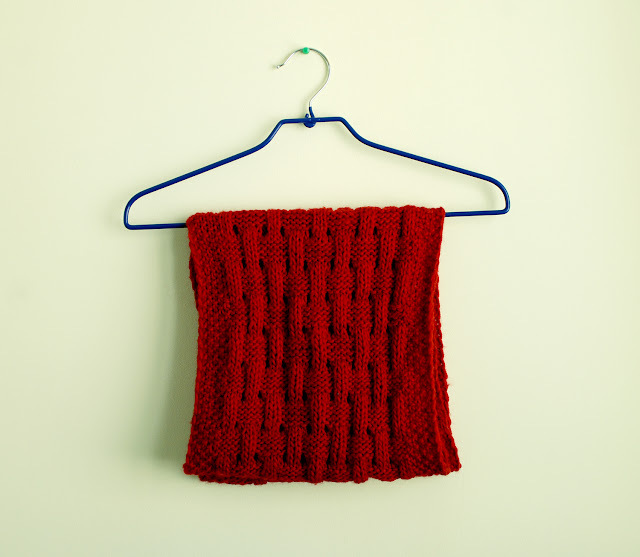 As an alternative to sewing a loop scarf from a warm wool fabric you can knit yourself one. 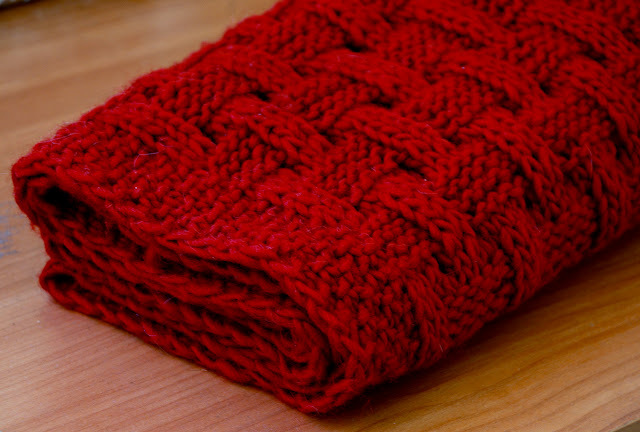 For this knitted scarf a basketweave knitting pattern was used. Basketweave pattern is an easy stitch pattern that combines knits and purls into a fabric that looks woven and really pretty. CO 46 sts. The 1st and last stitch form the edge of the knitting and therefore are not shown on the scheme. 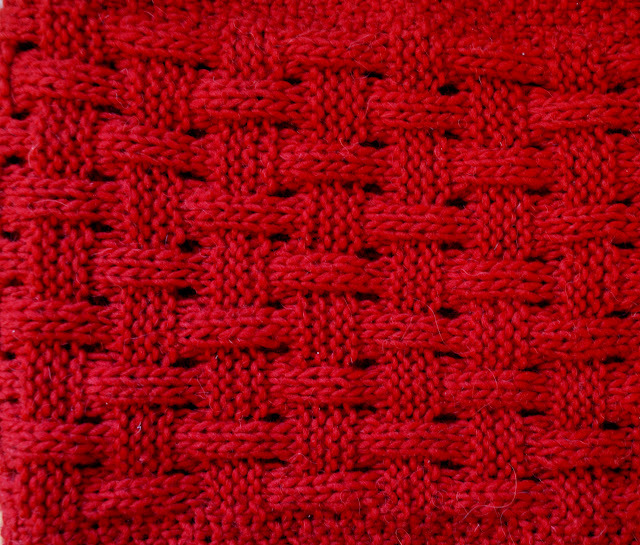 – 1st and last stitch form the edge of the knitting and therefore are not shown on the scheme. Update: I have interchanged the written instructions to the chart pattern. I think this will be more understandable. Moreover, one should keep in mind that there’s more than one way to wear an infinity loop scarf. Check out the ‘How To Wear an Infinity Scarf‘ blog post for more photos. What weight yarn did you use? Hi Sara! I used 8 oz. (200 gramms ) of yarn. Could you explain what the stars mean in your design? Example: “P1, K1,P1, K1, P1 *P* P1, K1,P1, K1, P1″ I’m a beginning knitter and I’ve never seen that in a pattern before. Thank you! Stars mean that you have to repeat the pattern until the end of row. Let me know if you need any additional assistance with the pattern! Thanks! Actualy it’s not reversible, but I have just checked and the reverse side looks quite extraordinary. What a lovely pattern! Is this knit in the round? No, the ends were sewn together, after the scarf was done. In the pictures it does look like it was knit in the round, Or did you just join it up after? Yes, you are right. It was joined up after. How many stitches did you cast on to make it 10 inches wide? I cast on 38 stitches. If you want to make it wider – simply add the number of stitches dividing by 7. Ex: 45 stitches or 52 stitches. I tried this, and ended up with a pure mess. It didn’t look like basket weave at all :c However, I always knit from left to right, turning my work between rows, and I’m wondering if that’s what I did wrong here? Did you knit the scarf left right – right left and so on? What brand of yarn did you use?? I used some yarn I had stashed in my closet and unfortunately it doesn’t has any lables. I would advice using combined yarn with wool and acryl, so that the scarf won’t fluff. Does this pattern work in the round? 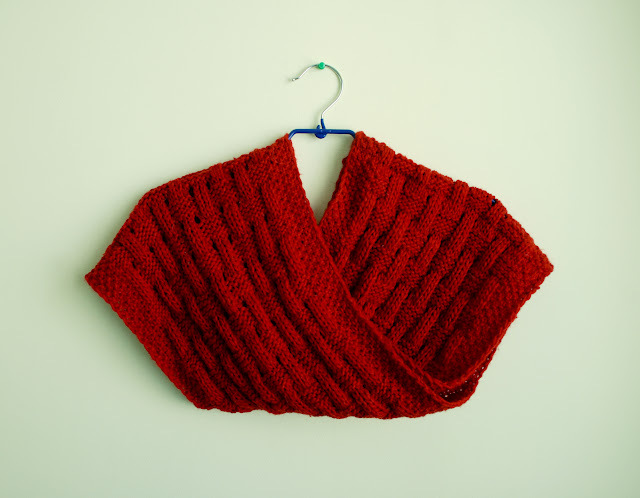 Could it be knit in the round by knitting the framing pattern for a few rows at the beginning and of cowl? I guess so, although, don’t you thinks it would be more difficult to knit such a long circle? This pattern is not working for me either. I guess because the first row is K1 p1 k1 p1 k1 k2P5* k1 p1 k1 p1 k1 and the second row is p1 k1 p1 k1 p1 p2K5* p1 k1 p1 k1 p1. Shouldnt row 2 and 4 be k5p2 instead? I guess I will try it that way and see if I see a pattern because the way it is written above I am not getting the basket weave patter because I am perling two of the first 5 knits from the row before. Let me check the pattern once again and get back to you. You might be right. Yeah there is something off with this pattern. Also, it states, multiples of 8 sts plus 10…shouldn’t it be multiples of 7 sts plus 10? I just don’t see how you would even create a basket weave with not repeating any of the rows consevutively, then reversing the pattern and repeating. 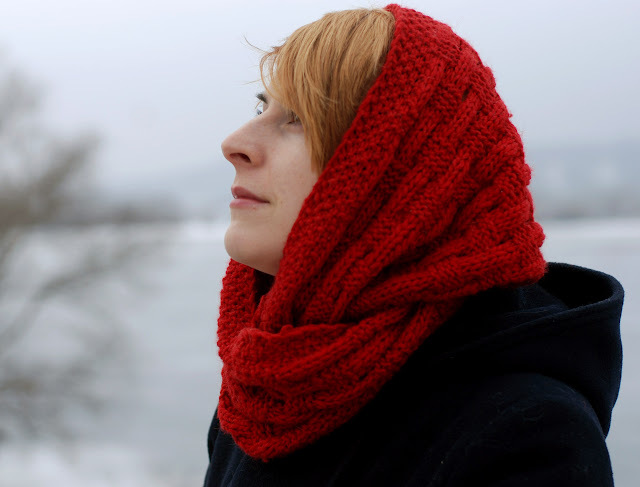 I saw this scarf pattern yesterday in an AllFreeKnitting post on Facebook. I love the way it looks, but obviously there is no written pattern that works and from everything I’ve read here, no one has any idea just how to make it. I think I will follow the edges as written here and simply look up basketweave pattern instructions online. It does say that it is 40″ long and 10″ wide and is made with 6mm needles, which is either a size 10 US. Way back in January Sara asked what weight yarn was used and as the answer was “I used 8 oz. of yarn.”, that’s no help. Also it mentions 2 5 oz. skeins at the beginning. But I know I saw somewhere that it takes bulky (or chunky) weight yarn which makes sense with that large a needle. In the chart on row 5 there is the symbol for ssk. I think it means slip, slip, knit? beautiful pattern, however, instructions are confusing and seemingly not accurate. I was eager to try it but after reading all the comments I rather not. Please make sure to mention how many stitches to cast for a project rather than the measurement, it’ll help greatly. Can someone lead me to a printed version of this scarf, it is beautiful.